Warning: You are strongly advised to use Google Chrome when accessing this tool. The OME does not work in Internet Explorer. Users have also reported that recent updates to Firefox block key functionality within the tool. What is my AD Username? 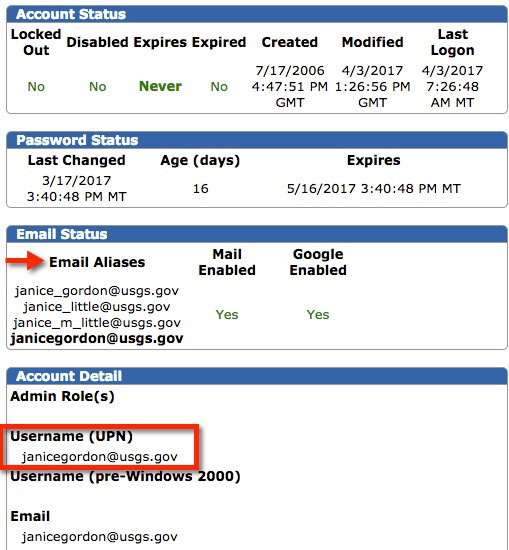 For many USGS staff, the email address they use everyday is their Active Directory Username; however, for others, this is not the case. A number of USGS staff have aliases associated with their Active Directory profile that also allow email to be delivered to their mail account; this is especially true for people whose name has changed at some point during their employment. Some users have short name aliases that allow for a briefer email address. Many USGS contractors now have the ".ctr" designation appended to their email addresses. In all of these examples, the email address used daily by the individual may not be his or her actual Active Directory email address. Go to Active Directory User Lookup (USGS ONLY - a USGS colleague can login and lookup your information if you cannot). Enter your first and last names; 'Select' your name from the results. Look at your Active Directory record and locate the field 'Username (UPN).' This is the value you want to use to login to Active Directory authenticated applications. You may see one or more aliases for yourself, but always refer to the 'Username (UPN)' field to determine your Active Directory username. Once you've determined your Active Directory username, enter it in the login; then enter your current Active Directory password (note: this is the password that you must change every 60 days; it is not your PIN associated with your USGS badge). If you still cannot login with these credentials, contact the USGS Service Desk at 703-648-HELP (4357) for assistance. You must acknowledge the warning message to be a user of this system. Problems with your AD login? This tool was developed through a partnership between the USGS Science Analytics and Synthesis (SAS) Program and Oak Ridge National Laboratory.